Want to be a princess for a day? 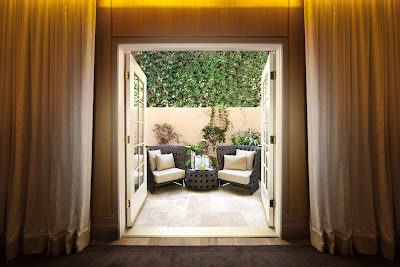 Then a visit to The Hotel Bel-Air Spa by La Prairie is most definitely a must. I had the great fortune to visit the spa during my trip to Los Angeles this past weekend, along with my friend (and The Beauty of Life contributor!) Jennifer Lee. We were both absolutely blown away by the entire experience -- it was indulgent, relaxing and everything our little hearts could have desired. Champagne and birthday cake. What could be more divine? Jennifer and I each experienced a luxurious treatment during our visit (more on those in a moment). Afterward, we were each taken back to the relaxation room, where we were greeted with glasses of champagne and a slice of birthday cake! Really and truly, the spa thinks of everything and caters to your every need, making your experience truly delightful and the epitome of luxury. Jennifer and me after our treatments. Don't we look relaxed and rejuvenated? 1) The ability to choose my own music. La Prairie provides a list of around 30 different CDs you can choose, ranging from easy listening and classic spa music to light rock. I went with Norah Jones. 2) To further enhance the marine feel, you lay upon a heated plastic bag filled with water, making the bed as close to a waterbed as possible! I happen to love a waterbed, so this was both fun and completely unique. My esthetician, Jackie, could not have been nicer or paid more attention to detail when it came to my skin. Various cleansers, moisturizers and gels from both the Advanced Marine Biology and Cellular lines were applied to my skin with precision -- including the Cellular 3-Minute Peel, which I was nervous about (my skin tends not to react well to peels), but Jackie assured me it would enhance exfoliation and shrink my pores. (She was right, and afterward? My pores were MINISCULE.) While my face steamed and my pores opened, Jackie massaged my hands and arms with Cellular Hand Cream, which basically sent me into a blissful daze for the rest of the treatment! After some painless extractions (Jackie had a light-as-air touch), she proceeded to perform my favorite eye massage to date. In most facials, the eye massage just concentrates on the under-eye area ... but, here, it went from the brows to the temples to the cheekbones. As a migraine sufferer, I'm always looking for ways to reduce the pain and tension in my sinus area, and this definitely did the trick. This part of the treatment was concluded with the application of the Advanced Marine Biology Tonic, a serum which works to reduce wrinkles and hydrate the skin. Then came my favorite part of the treatment -- the mask. Jackie mixed up a rubberizing mask and applied it onto my skin, letting it sit for about 15 minutes. While it firmed and rubberized, I received both upper body and foot massages with the Cellular Body Emulsion that were completely out of this world. Jackie removed the mask and then performed a second eye massage with Advanced Marine Biology Eye Gel, before applying the Cellular Luxe Lip Treatment SPF 15 to my lips and the Advanced Marine Biology Revitalizing Emulsion to my skin. The treatment finished with a fantastic head massage, complete with acupressure techniques, that erased all signs of a migraine from my head and sent me straight to relaxation heaven. After the best shower of my life, I popped into the steam room -- a beautiful dark space with mosaic tiled benches and twinkling lights on the ceiling. I chose to combine the lavender and eucalyptus aromatherapy sprays that were in the room to really customize my scent experience. Another rinse off later and I was off to the relaxation room, where I was soon greeted by Gina, the nail technician who performed my indulgent White Caviar Illuminating Pedicure. I was offered magazines while my feet soaked in a warm tub. Though I had the latest edition of Vogue in my hands, I spent the entire time talking to the very delightful Gina like we were old friends. After gently exfoliating my feet and legs with Cellular Microdermabrasion Cream and my heels with a file, Gina massaged my tired legs with the Hydralift Firming Mask, slathered on the 3-Minute Peel, wrapped my feet in plastic and tucked them into heated booties. While my feet toasted for five minutes, Gina turned her attention to my hands, massaging them with both the White Caviar Illuminating Serum and White Caviar Illuminating Hand Cream SPF 15. (Side note: the White Caviar line not only moisturizes but firms and tones as well.) My dry hands drank up the super hydrating formula and immediately looked brighter. Gina also expertly trimmed and shaped my nails and cuticles. Then it was back to my feet! Gina toweled them down and wiped off any lingering residue with the Age Management Balancer. Then, in circular motions, she gave me yet another fabulous leg massage using the Caviar Body Emulsion. Finally, after all the pampering, it was time to apply color. The spa features Deborah Lippmann polishes and I chose the deep, rich wine color of Single Ladies. This is by far the most indulgent thing that’s every happened to my poor feet, which spend daily barefoot battles in yoga, pilates and barre classes. Gina explained that the process of layering products is more akin to a facial than a traditional pedicure, and I couldn’t agree more. Perhaps the best thing is this: while luxurious, soothing and wonderful during the treatment, the results have lasted well beyond the 90 minutes. Three days later, the polish is still shining beautifully and my feet are still baby soft. This is what it must feel like to walk on clouds! 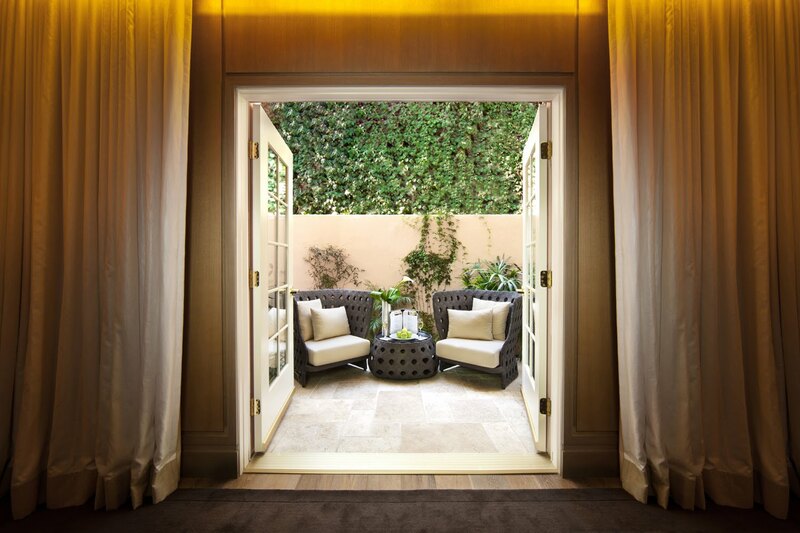 For more information about The Hotel Bel-Air Spa by La Prairie and to book an appointment, visit hotelbelair.com/la-prairie-spa. OMG im so jealous Jamie! You guys look soo relaxed! The price isn't too bad either.